I have been producing Black and White images for as long as I can remember. Actually, like many photographers, I started out shooting only for Black and White. With nearly 20 years of Black and White processing, you’d think I couldn’t learn much more right? There is always an opportunity to learn new things if you open your mind to them. My great friend (and fellow educator) Jim Welninski has taught me so much about architecture and black and white photography. I remember the first time I saw him instruct, I was jealous, the epitome of jealous. “Why didn’t I think of that?” I thought to myself. But then it occurred to me; there is no room for that jealousy. If you focus on that, you will never focus on all that you can learn from a real artist like Jim. I embraced the education I received from him, and from it, I have been a much better Black and White artist since. Jim has a new course out called, “Black and White Artistry” and it is incredible! After watching it and talking to Jim, I asked him if it would be okay to share some of the things I learned and he happily consented! You can read about them below, or watch the full-length video tutorial below. Jim and I firmly believe that the Gradient Map is the best conversion method for Black and White photographs. It applies the proper tonal value to the hue of the colors in your image. So your dark blues become a dark shade while colors like yellow become close to white. This technique is few and far between when compared to the HSL desaturation method that simply desaturates your purest colors. Jim has this awesome trick where he makes two copies of the original photo. One is an overexposed image; the second is an underexposed image. He fills these copies with a Black Mask. Then he selectively paints back areas that he wants lighter and darker with a white brush on the mask. This tip might sound like dodging and burning, but it is much more effective, especially when done on curves adjustment layers. 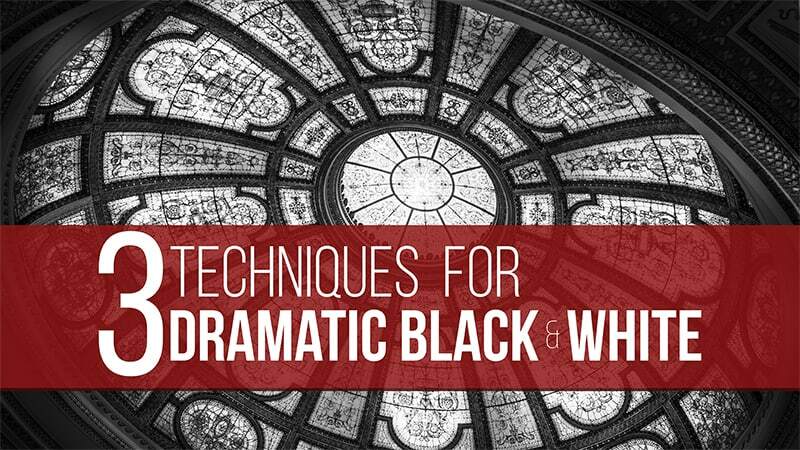 Jim taught me this incredible trick for instantly adding drama to your black and white images. It is a solid black fill layer set to normal at about 75% Opacity. It covers your image in a dark veil that is almost spooky and eery. The real fun comes when you “punch holes” in the mask to reveal all the work from steps 1 and 2. This technique will add what appears to be a custom vignette but is much more fun to produce. What I am sharing with you just scratches the surface of Jim’s course. He goes into much more detail and is such an inspiration to watch. I implore you to check out his full course, so click on that big orange button below! *This is an affiliate link, but remember I would not recommend something that I did not think was TRULY awesome! I know Jim’s course will dramatically change the way you see in Black and White! which softs and plugins does Jim use in his course ? photoshop ? zse ? palette effect ? on1 ? sep2 ? hey Marc! He uses Silver and Color Efex in the tutorials. Have you tried applying the second and third steps without doing the B&W conversion? your demonstration of gradient map on the test pattern is awesome ! do you mean that ON1, luminar, tonality pro, topaz,… are missing something not implementing these ? Awesome stuff Blake and well presented as always. Looking forward to doing Jim’s Black and White Artistry course. Wonderful. I’ll definitely use it but, truly, it isn’t three techniques. It is three steps to one wonderful technique. when you punch holes in black layer or when you dodge and burn, do you confirm you leave opacity of brushes at 100% ? Thanks for a terrific technique and for sharing it with us! just purchased the jim course. really nice course i advise but really a pity after having promoted gradient map (perfectly working with ZSE) he comes back to obsolete sylver efex pro 2 and color efex pro 4. we come back to prehistory waiting for dxo updates while Jim is a ON1 coach with lot of amazing Jim’s b&w presets. it is my only complain. Hello. I would like to buy a black and white course, click on your link to the sales page. I see the price of 87 dollars, I press to buy and on the next page the price of 147 dollars? Why? I need to insert a coupon, but I do not have it. How to be? Sincerely, Victor. Hello Viktor, I just brought it to his attention. It is fixed now! Sorry, but I missed out on the promo as I was not able to access my emails for a while. Is there any chance of getting the promo code again? Thank you for the B&W techniques. Fantastic. I went to Jim’s site for his course and it seems it is no longer active. Do you know if it will it be coming back?